I don’t have kids and won’t for a while yet, but I want to buy this book now so I don’t forget about it. And still, it seems silly to do so. 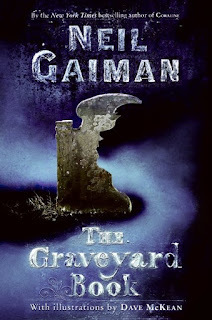 You can now listen to (and watch if you want) Neil Gaiman read The Graveyard Book in its entirety here. He read one chapter at the Tivoli Theater in Downers Grove. I’ve had a copy of this book since May, looked at the cover image countless times, but it wasn’t until today that I finally got it. I kept thinking it was this weird tombstone shaped something like an angel’s wing. Nope, it’s the silhouette of a boy’s face cut out of the tombstone. I’m usually pretty good about those things. In 1789, the governor of Australia granted land and some animals to James Ruse in an experiment to see how long it would take him to support himself. Within 15 months he had become self sufficient. The area is still known as Experiment Farm. This is my Experiment Farm to see how long it will take me to support myself by writing.